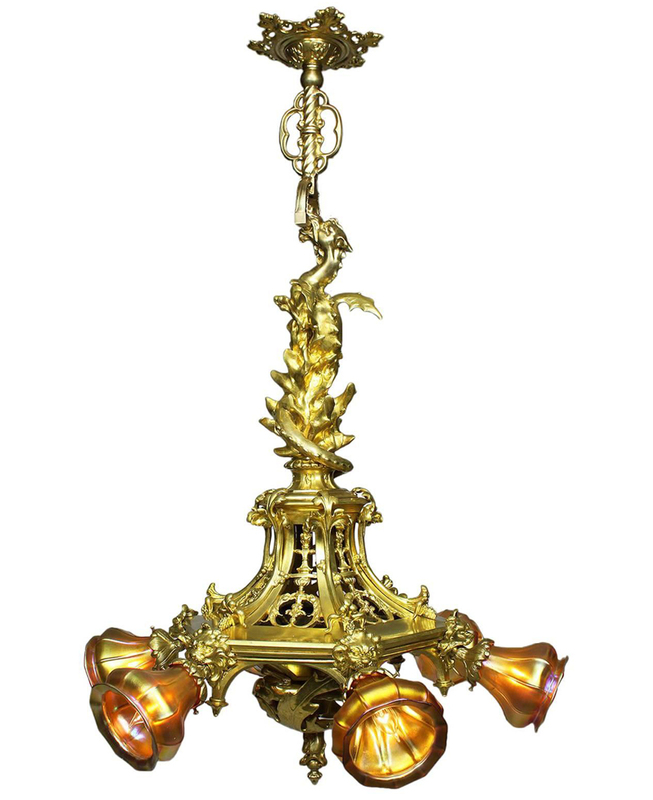 A Very Fine and Rare American Gothic-Revival Gilt-Bronze "Dragon" Six Light Figural Chandelier. 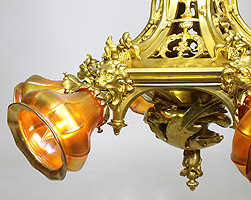 The elongated body in the form of a winged dragon biting on a perch with his tail wrapped around an hexagonal pierced gilt-bronze basket surmounted with six lion masks, each holding an iridescence glass shade. 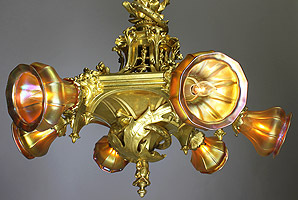 The bottom of the fixture with the dragon's tail end, in the manner of Louis Comfort Tiffany (American, 1848-1933). Circa: New York, 1900. Louis Comfort Tiffany (February 18, 1848 – January 17, 1933) was an American artist and designer who worked in the decorative arts and is best known for his work in stained glass. He is the American artist most associated with the Art Nouveau and Aesthetic movements. He was affiliated with a prestigious collaborative of designers known as the Associated Artists, which included Lockwood de Forest, Candace Wheeler, and Samuel Colman. 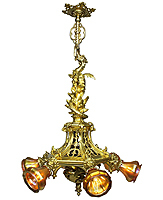 Tiffany designed stained glass windows and lamps, glass mosaics, blown glass, ceramics, jewelry, enamels, and metalwork. 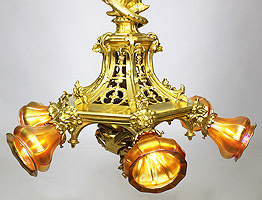 He was the first Design Director at his family company, Tiffany & Co., founded by his father Charles Lewis Tiffany.